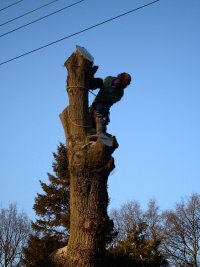 Tim Hope Tree Surgeons are highly skilled in all aspects of tree surgery, and tree care. 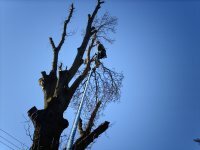 All staff are fully conversant with methods of tree surgery,tree pruning, felling trees, crown lifting, crown thinning and reducing. 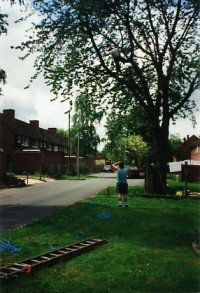 The picture above left shows us pruning a tree on a housing estate where care has to be taken to ensure public safety. 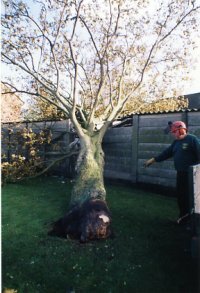 The picture above right shows what we found when we arrived to a customer who had a tree blown down in his garden by high winds. 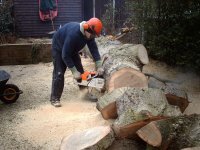 As we are also fencing contractors, we were able to repair his fence as well. 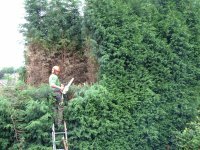 The above pictures left and right show our ability to cut down large trees, or a leylandi hedge that had grown to about 7 metres being reduced to a more managable 3.5 metres. 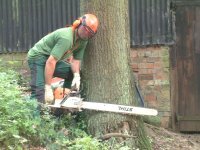 When a job has been completed, we make sure that before leaving all waste and debris is cleared away leaving the site nice and tidy. 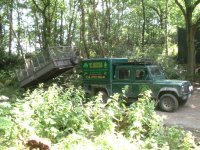 We have a tipper trailer as shown above, or we use our Timberwolf chipper. 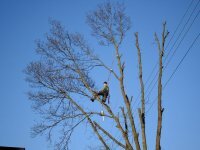 The pictures above show us felling a tree where we had to take extreme care due to its location and its proximity to power cables. 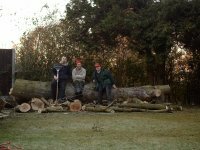 We had to literally take this tree down piece by piece, small pieces at that, lowered to ground using ropes. 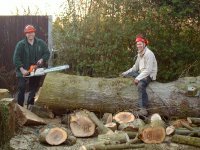 This is the same tree now we have felled the trunk, though it seems to be much bigger than when it was standing - the weight of this tree is measured in tons. Still, it has now been poleaxed by the team! 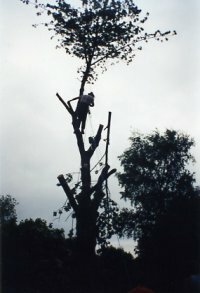 All Contents, Images and Text ©2006 to Present Date Tim Hope Tree Surgeons.